You know the feeling — when your server goes down or your email has the hiccups or some dastardly virus has infiltrated your otherwise peaceful online existence. At times like that, can you blame me for uttering those blasphemous words? I think not. You see, it all started when I tweeted that I had bought some fabulously soft, juicy, drippy-licious Suncrest peaches at the Frog Hollow Farm store at the Ferry Building in San Francisco. Then, what happens, but two days later, I find a huge box on my porch of just-picked nectarines, courtesy of Frog Hollow Farm. Big nectarines is more like it. Sweet, with just the right amount of tang, too. The recipe is from “Ready for Dessert” (Ten Speed Press), the new book by pastry chef and blogger extraordinaire, David Lebovitz. The open-face, rustic tart starts with a simple dough that comes together in a pinch in a food processor, stand mixer or in a big bowl as you wield a pastry blender. The circle of dough is smeared with the frangipane, a thick, intensely almond tasting pastry cream made from sugar, flour, almond paste, almond extract, butter, an egg, and a little bit of rum, if you like. Finally, slices of fresh nectarines are fanned out over the top. Then, the edges of the dough are folded over to hold everything in. The galette emerges from the oven flaky, buttery and crowned with soft, tender fruit enhanced by the rich frangipane. The recipe directions call for making one large galette. I actually made two smaller ones instead, so that I could give one to a friend. If you make two, you’ll only need to bake them in the oven for about 35 minutes. I still have my moments where I’m not thoroughly fond of technology. But I promise now not to bad-mouth it quite so much. I can’t anyway — not with my mouth full of nectarines. Preheat oven to 375 degrees. Line a baking sheet with parchment paper or a silicone baking mat. Pit and cut nectarines in 1/2-inch slices. Lightly flour a work surface and roll out dough into a circle about 14 inches in diameter. Transfer it to the prepared baking sheet. Smear frangipane over the dough, leaving a 2-inch border. 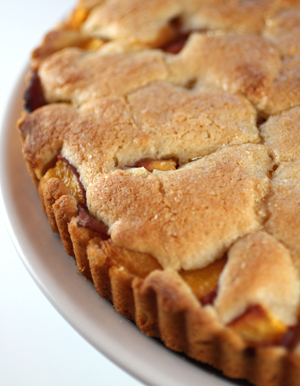 Arrange nectarine slices in concentric circles over frangipane, or simply scatter them in an even layer. Fold border of the dough over the nectarines and brush the crust with some of the melted butter, then lightly brush or dribble rest of butter over nectarines. Sprinkle half of the sugar over the crust and the remaining half over nectarines. 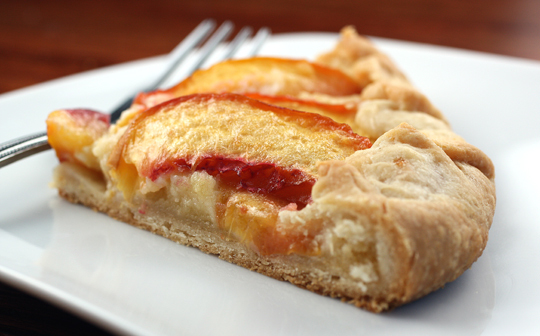 Bake galette until nectarines are tender and crust has browned, about 1 hour. Slide galette off the parchment paper and onto a wire rack. Note: The dough can be made up to 3 days in advance and refrigerated. The tart should be serve the day it’s baked. 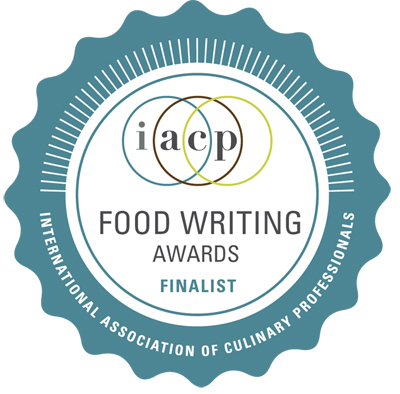 In a large bowl using a pastry blender, in a stand mixer fitted with the paddle attachment, or in a food processor fitted with the metal blade, mix together flour, sugar and salt. Add chilled butter cubes and mix until butter is broken into pieces about the size of large corn kernels. Don’t worry if a few pieces are in larger, rough chunks; they will make the dough nice and flaky. Add ice water all at once and continue mixing just until the dough begins to hold together. Shape dough into a 5-inch disk, wrap it in plastic wrap, and refrigerate until chilled and firm, at least 30 minutes. Use as directed in the recipe. Note: Disk of dough can be refrigerated for up to 2 days or frozen for up to 1 month. 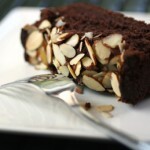 In a food processor fitted with the metal blade or in a stand mixer fitted with the paddle attachment, mix together almond paste, sugar, flour, and almond extract until almond paste is in fine pieces. Add butter and mix until completely incorporated, then add egg and rum, if using, and continue mixing until frangipane is as smooth as possible. 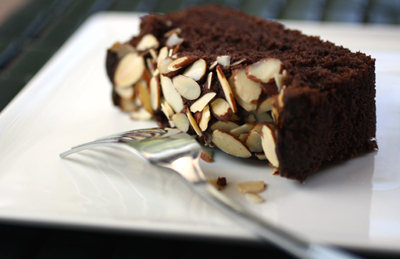 Don’t worry if there are a few tiny bits of almond paste; they’ll disappear with baking. Note: Frangipane will keep in the refrigerator for up to 1 week, or in the freezer for up to 1 month. For easier spreading, bring it to room temperature before using. I prefer nectarines to peaches. That galette looks extremely delicious. A perfect flavor combination. Frangipane is a great choice. How do you like this new book by David? I’m still thinking about getting it. Maameemoomoo: So far, I like David’s book. This is the first recipe I’ve tried from it. There are quite a few others that caught my eye, too. This is one of the most delicious sounding (and looking!) recipes I have seen in a long time. I am compelled to make it: this weekend I think! As for your twitter-to-fruit delivery experience, I am jealous and it makes me think twitter might not be so bad after all! Tami: Wow, there’s a mix for frangipane? Do you just add water or something. Leave it to the French to come up with something so fab. Oh wow, this looks delicious! I’ve seen galettes before but they didn’t include the frangipane. I think it will make the galette taste so much better. Must try this recipe now! 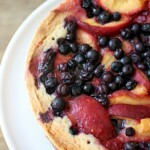 I love nectarines, I am waiting for those fruits to come in season here, the galette looks beautiful too. Lovely nectarine dessert. I would have to buy more to have some left for making this. 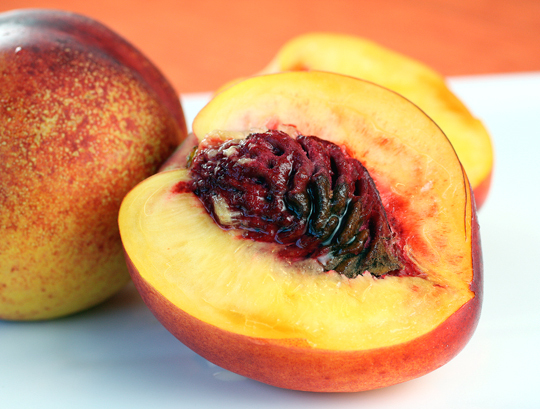 I love nectarines…just so good! I too have been dabbling with galettes. First, apricots, then apricot/blueberry, then cherries, then peaches. 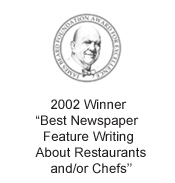 I fell in love with them while interning at Chez Panisse this past spring. You have inspired me to source out almond paste, and David’s new book, and encounter the wonders of frangipane. Nectarines and plums are just around the corner up here and I can’t wait! Onward! 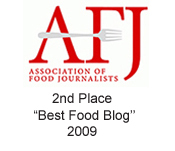 Ju: A sad encounter with a galette? Oh no!! Do try again. They are so much easier to make than pies. Let me know how your next one turns out. Okay, I know and ADORE that company. I was first introduced to it during the Foodbuzz Festival, and they seriously have some freaking amazing peaches and nectarines…ESP their dried peaches! I hope you get to try those too! Hehe I know what you mean. When technology works, there nothing more brilliant but when it fails, it fails spectacularly! This galette however is just plain spectacular! OK, here goes, “I love nectarines” “I love technology” I somehow think I ‘ll still have to go to the store for my supplies to make this incredible sounding dessert. Thanks for sharing. 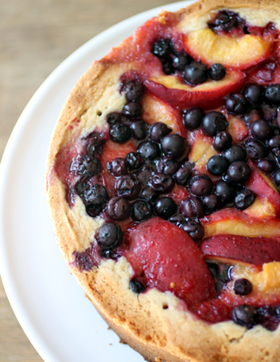 The galette looks so gorgeous and super delicious with nectarines and frangipane! 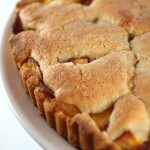 We haven’t had nectarines this season yet, just peaches, must remedy that this weekend! I agree about the difficulties and annoyances of technology. Sometimes it is so easy to bad mouth it until you need to find a recipe online or something like that. 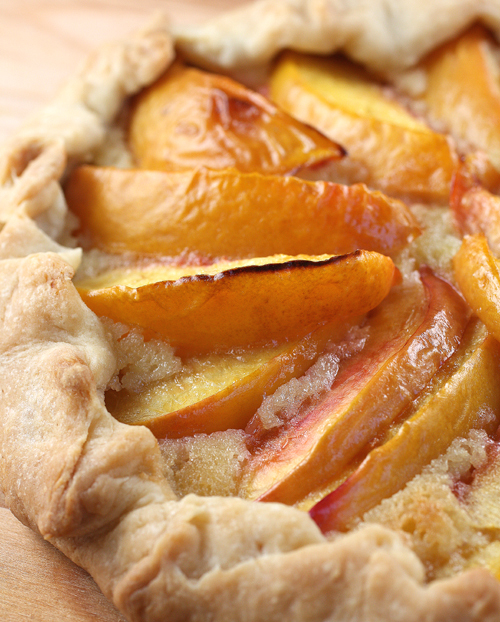 The Nectarine-Frangipane Galette is pretty mind-blowing. Excellent pictures and picture perfect nectarines. That’s a beautiful galette! And, I wouldn’t mind big brother delivering delicious fruit. Great use of technology. I just visited SF and had the pleasure of walking around the Ferry Building Marketplace… you’re so lucky to have access to that wonderful place all the time, esp if deliveries magically appear on your door. I think I might have to buy “Ready for Dessert” now after seeing your pictures and posts. delicious! i just made a nectarine upside-down cake, but this actually looks much tastier! You are so lucky! I live for stone fruit season at the farmers’ market, but can hardly bear to cook them. This looks so good I may have to try it. I love fruit galettes, especially the frangipane. And David Lebovitz’s recipes are a favourite. Your pictures are tell me that they were excellent. This so lovely to see, truly awesome ! i bet it taste fantstic! Lucky you! Twitter is fantastic – lots of contacts you can meet and it makes you think that this is a small world afterall! Anyway – lovely use of the nectarines… next time they are in season in Sydney THIS is what I am making. If only I had that kind of magic. Alisong: You can freeze the dough easily. Just defrost in the fridge overnight before rolling it out. I’ve also frozen leftovers of the baked tart. Just defrost in the fridge or on the countertop, then heat in the oven before serving. Great pic of the nectarine. Any ideas what variety it may be? Or perhaps you may remember when you bought it, and that might narrow it down. Great inspirational blog and pictures to go with it!